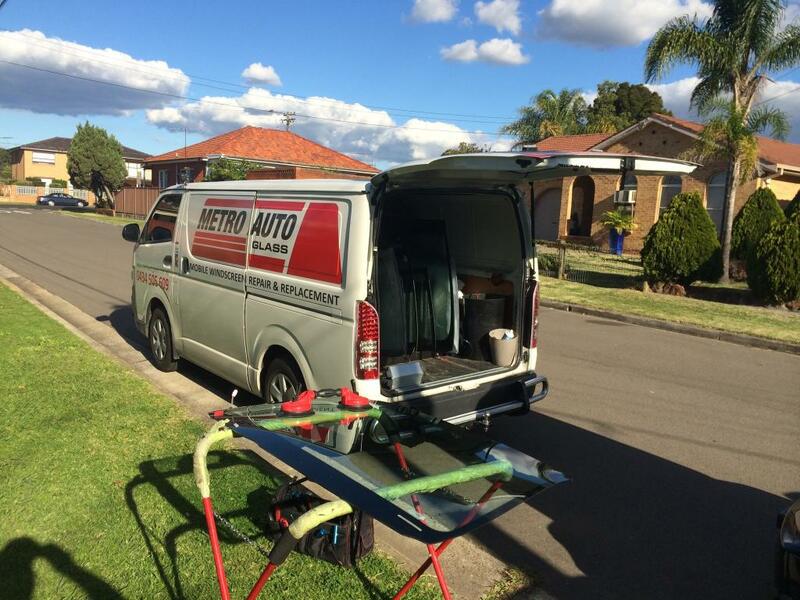 etro Auto Glass specialise in car windscreen replacements in Sydney, NSW. Check out some of our before and after photos below. odern car windscreens are made from laminated safety glass. This is very important to protect you and your passengers if the glass gets damaged. Without this protection broken glass shards would cause a lot more damage in an accident. Regardless of this level of safety, any damage to your front windscreen should be fixed as soon as possible. Metro Auto Glass give you the option of choosing genuine or aftermarket windscreen glass to use for your replacement. To ensure maximum safety we always fit all windscreens according to manufacturers specifications. Many modern vehicles now include rain sensing technology in the front windscreen glass. If you want to keep the functionality of your rain wipers switching on automatically when the windshield gets wet you will need to purchase replacement glass that has this built in. Give our friendly team a call now on (02) 9800 9509 to discuss your options. Once we have your damaged windscreen removed safely, we use Bostik Simson Primer G on the body of the vehicle prior to installing the new windscreen. This prevents future corrosion and rust. We then apply Bostik Simson 70-08 glazing adhesive, requiring only one hour to dry. We get you back on the road fast with reliable, safe and quality service. At the conclusion of the installation we remove and dispose of the old windscreen at no extra cost and all work comes with a lifetime warranty. ear windscreen glass is made from toughened or tempered glass much like your cars windows. Some rear windscreens have GPS aerials, wiper motors, heat demisters, defog sensors, electronic tinting and other technology that requires extra attention. Before we remove your rear windscreen we disconnect all wiring. We carefully clean and vacuum any shattered glass from the interior and crevasses. The replacement starts with us appling Bostik Simson Primer G and Bostik Simson 70-08 glazing adhesive. We then install the new rear glass along with new rubber seals. our cars windscreen is held securely in place with black rubber seals that go the whole way around. You will be pleased to know that we provide new rubber replacement and re-sealing for all Sydney windscreen replacements as no extra cost. Due to the harsh Australian climatic conditions, over time car’s vehicle seals and rubbers become dry, brittle or fade in colour. In some cases the damage is only cosmetic and can easily be repaired or replaced. Though this may be true in most circumstances, this damage could turn into further issues if not dealt with properly. This may also be due to incorrect installation of the windscreen from previous work. When replacing your rear or front windscreen it is essential to replace the seals which is why we do so at no additional cost. If you wish to request new rubber seals but wish to keep your existing windscreen, please speak with our experienced team today. All our rubber replacement and re-sealing carries our lifetime warranty. indscreen chip repairs are a cheap way of fixing a damaged windscreen. We can fix any chip or crack within the size of a one dollar coin. It is important to fix chips or cracks before they spread, otherwise you will need to replace the whole windscreen, which will obviously incur a higher cost. We fix chips and cracks by injecting a quick drying resin that stops a crack from spreading further. This repair is about one third of the price to complete the replacement of the windscreen. For all your windscreen replacement / repair and chip repair needs please contact Metro Auto Glass today on 02 9800 9509 or use our online quote request form. We’ll get back to you on the same day! All our workmanship carries a lifetime warranty.